The wait is over... The NEW Guest session customer recall reporting system is here. You can now monitor and analyse your customers when they are waiting to be recalled, the new guest sessions allows you to visually see all customers names, coaster number and the time they have waited to be recalled allowing you to improve the time customers are waiting on average. The guest sessions free IOS application works with CS4,CS6 and CS7, you are able to set a maximum time so that if a customer has been waiting longer than the time set it will change colour on the screen. This great NEW application allows you to record your customers wait times and analyse them overall improving your business. 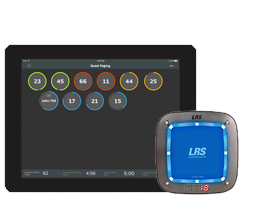 With our 13 years of experience, LRS continues to redefine the paging industry with customer-driven features. 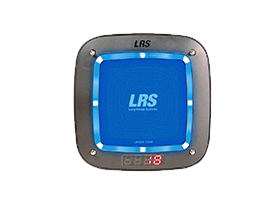 With our shock absorbing bumper and Lexan case, LRS now boasts that our coaster pager is the most durable guest pager in the industry. In addition, LRS pioneered the first anti-theft, auto-locate and tracking features to reduce loss to an absolute minimum. 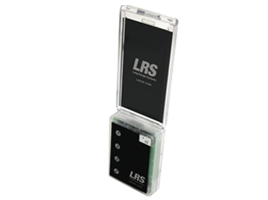 The Adverteaser paddle pager from LRS was designed with the customer in mind. To minimize breakage, LRS chose to bypass acrylic and manufacture its pagers with durable Lexan material, the strongest plastic available. LRS Adver-teaser also has no exposed screws to prevent customer tampering. With its one-piece construction, there are no belt clips to break. The large, double-sided advertising area holds standard business cards maximizing your marketing potential. For easy customization, these business cards can be purchased at any office supply store and printed on a standard laser printer. Utilizing 4 LED messaging lights and the strongest vibration on the market, you can be assured your guests will never miss a page. Overall size: 1.5" x 6.0"